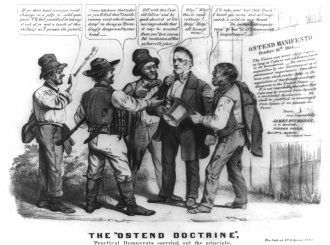 Political cartoon about the Ostend Manifesto. Ostend Manifesto is a decision that can be enacted by the USA before the American Civil War once average consciousness is above 4. It gives the United States cores on all provinces in Cuba and lowers consciousness in all slave states by 1, in exchange for 6 infamy and -150 relations with all Great Powers. The decision text says Cuba will become a slave state, but one is actually not forced to admit it as a slave state at the end of the war with Spain/Cuba. The AI will not use the Ostend Manifesto unless it has less than 25 prestige. This page was last edited on 29 June 2018, at 12:47.